Wesley Henderson, a former member of the Kiwanis Kavaliers, Seattle Cascades and Pioneer, submitted this photo and caption. This is a picture of my sister Kelly and me after my "home show" in Albuquerque, N.M. last summer. She deserves all the credit for attracting me to music. I truly believe if she was not in color guard in high school, I would not have wanted to participate in band while in middle school. 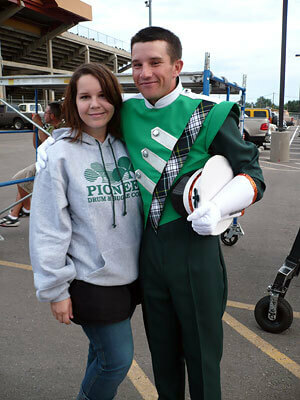 Seven years in middle and high school band and three years with drum corps would not have happened if not for my sister. This summer I am going to be a staff member with Pioneer and my love for music is still going. Thanks Kelly, love you!